The Colangelo-ization of the Colangelo College of Business at Grand Canyon University continues in earnest, and earnest is the operative word here. Jerry Colangelo addressed business graduate students during a lecture on Thursday, then stuck around for a long Q-and-A session. 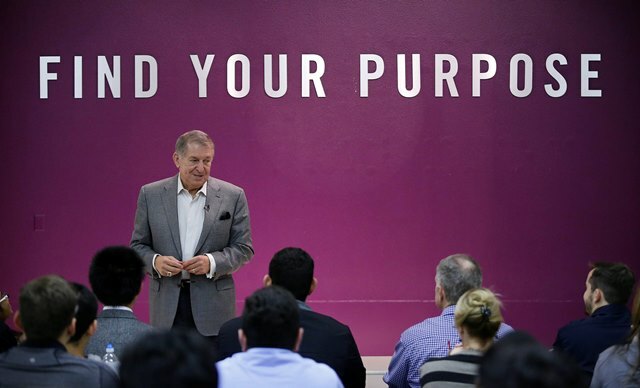 Jerry Colangelo, the Phoenix icon whose name, expertise and integrity have been injected wholly into the college, spoke to a group of CCOB students Thursday night for about the 10th time in the past two weeks. Just as Colangelo said he would be, he is active and involved in the school’s doings. 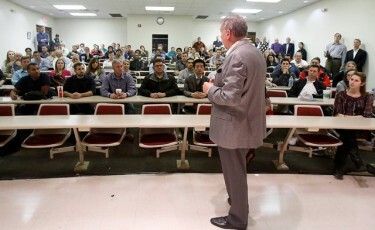 But the significance of this gathering went beyond Colangelo’s various messages, which center on having a strong faith, working hard and taking calculated risks, because this was the first time he spoke to the college’s graduate students. Before the college was named for him in September, Colangelo had been affiliated only with the Colangelo School of Sports Business, which does not yet have a graduate program. Judging from Thursday’s question-and-answer session, the response was tremendous. Colangelo spoke for about 20 minutes, and the questions kept coming for twice as long — and could have gone on much longer. The questions were good. Colangelo’s answers were even better. “The students genuinely enjoyed that,” said Dr. Brian Smith, director of the sports business school. “It’s clear that he cares, and I think students are realizing that, wow, this is way more than just a name on the building. A large crowd gathered to hear Colangelo talk about his business principles which include strong faith, working hard and taking calculated risks. Thursday’s session was supposed to last only a half-hour. Fat chance, once Colangelo got going. He’s a storyteller, and he was more than willing to tell more than a few. One of those students Thursday was Joel Ortiz who, like Colangelo, grew up in the suburbs of Chicago before migrating to Phoenix. It was telling that most of the questions afterward were about those messages, not sports. One of the best was asked by Kelly Taylor, a Phoenix native who wondered where the virtue of patience fits in the grand scheme of things. “Patience is something I struggle with on a daily basis — when to be patient and when not to be patient and to go get it. And I think that over 50 years of experience there’s got to be points where he really had to be patient,” Taylor said. Colangelo counseled the students to learn when to be patient and when to recognize that it’s time to act. “Opportunity walks by and many people miss it,” he said.